Perhaps the most frustrating thing that happens to us here at NPG is this scenario. A prospect comes our way asking about our custom development services and solutions. We discuss the possibilities, how custom development differs from software licensing, and walk through the process of building a new project from the ground up. Then we send the prospect on their way with a variety of materials to review until we speak again. Sometime after that, reality sets in for the prospect, and they come to understand that developing a new project is a bit more time-consuming than they are ready for, leading them to seek easier alternatives. This is when the off-the-shelf software debate comes into play. Oftentimes, prospects see the overview of an existing software package and assume it can solve all of their problems. To the credit of the vendors and communities that make open-source software, they do make the decision-making process for development-anxious prospects much easier. Informational websites for SaaS software, licensed downloadable software, and open-source software packages do make it seem as though everything is possible. Software companies are spending almost as much on marketing as they are on actually developing the product itself. Rarely do you see a platform that has a crappy sales and informational website—more often, they are rich in content, regularly blogging, and powered by a sophisticated marketing automation tech stack under the hood. It goes without saying that one thing you never see on those vendor websites are the negatives. The language and positioning most software vendors use is that they have a solution for everything. Ironically, in my experience, the engineers at such companies know what their systems can and cannot do. It’s the sales and marketing folks who promise the world. Because you will rarely have access to an engineer who will tell you which end is up, it’s important to consider carefully everything these vendors tell you. Before we give you some things to look out for when shopping for off-the-shelf solutions, let me take just a step back to review the difference between building and renting. We’ve often cited the 90/10 argument: off-the-shelf software is highly efficient at getting you 90% of the way to your stated goals. But what about that last 10%? We call that the “area of impact” because it’s in that 10% of unrealized objectives that your business can actually differentiate itself from everyone else. The concept behind off-the-shelf software is to appeal to situations that are similar—not for outliers or other sophisticated scenarios. This rings true across the board, from open-source platforms such as WordPress all the way to enterprise software that costs hundreds of thousands of dollars. These systems are engineered to handle the most frequent scenarios, but not developed to enable you and your company to operate from a perspective of uniqueness. Granted, for many companies, being just like everyone else is fine. The mom-and-pop hardware store, the restaurant up the street, the simple consultancy—there are easy and cost-effective ways to get your website running quickly. But custom software appeals to a different type of client. Someone with a proprietary way of doing business. Someone that is looking to redefine how they approach their digital activities. And of course, there is much to be discussed about the value of owning versus renting software. We’ll dig into that a bit more below, but the core premise is that owning custom software can result in longer lifespans, more safety and security, and total control over the future of the platform. These are all areas in which software vendors or open-source projects lack. They are plagued by security hassles, constant upgrades, and battles over what can and cannot be done. We’ve long since given up on the hope that prospects will disregard the promises of marketing-savvy software providers. It’s human nature to look for cheaper, easier solutions that are faster to integrate. So instead of convincing you of the merits of custom web development, instead we’ll give you a summary of considerations to keep in mind as you evaluate off-the-shelf software. This is one of the most important risks to consider when you dig into off-the-shelf software. The portability of data and the ease of porting from one solution to the other in the future should be a chief concern. The biggest worry is that in utilizing a closed-source system such as a SaaS application, your data will be locked away and inaccessible should you ever leave the system. The best way to explain this problem is by using a hypothetical example. In the world of CMS platforms, there are now some new players in the space that are providing hosted CMS services in a decoupled manner. In some circles this is being referred to as CaaS, or Content as a Service. 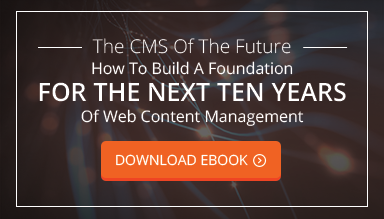 To be fair, we love the idea of decoupling your CMS—in fact, we wrote a whole ebook about it. But the problem that arises with a CaaS implementation is how you port away from the service provider if you ever have to. You will be utilizing their database, their data structure, and their API to power your front-end user experience. So if you were to ever leave, you’d have to port that data over and rewrite your front-end to use another API. That example is perhaps a bit more skewed towards what happens during a development platform shift in the future. But think about porting data from a business perspective. There are many systems that run in the cloud which users can get “addicted” to. We’re big fans of HubSpot’s system for marketing automation and contact management. However, using their CMS is a risky endeavor. Nothing about that system is portable. Building a content-heavy website utilizing their system (known as the COS) would mean future portability to a different platform would be painful and time-consuming. The lesson here: Always be interested in what your freedoms will be down the road in case the software you are licensing is sold, shut down, or no longer supported. Like I said, we see clients entertaining the idea of off-the-shelf software very often. Typically, it is an uphill battle for us to convince them otherwise after they receive a demo and see software already doing the things it’s built to do. When we hear about these amazing new platforms or software packages, we are careful to ask the right questions during a demo. The most important question is often just one word: How? Now, by no means are we saying that it is a good practice to ask deep, technical questions about how a platform works under the hood—especially if you can’t understand enough about the underlying technology to make a judgment. But rather, we are saying that it makes sense to see how a software provider’s promises add up. And these “how” questions should be focused on the most important part of your future with the software: scalability and flexibility. There isn’t a software salesperson in the world that will tell you their product isn’t flexible or isn’t scalable. If you find one, then you might as well have found a unicorn, because they don’t exist! So when you are vetting platforms, work hard to evaluate where the “gotchas” will be later. If they promise the ability to tie their software into a platform you use via an API connection or similar, ask how that works. And be upfront too—ask them where the shortcomings are. They may just tell you if you ask innocently enough. Almost every off-the-shelf solution we’ve ever seen has some level of compromise or lack of flexibility during initial implementation and onwards, in some cases negating the entire reason the software was chosen. Finding those issues earlier will save you frustration before it occurs. As I said before, software that is taken off the shelf isn’t built for you. It’s built for the masses. As such, it will require you to make sacrifices at some point to utilize the software to its maximum capability. If your business is new, you have the ability to define your workflows around the software you choose, which will mean you have a higher chance of finding a level of satisfaction versus established businesses who are transitioning to a different platform. Even so, new businesses must take into careful consideration how they will grow and evolve with the software they are evaluating. In most cases, it isn’t good for a business to make constant platform changes. Those who are with established companies and set in their ways will have a difficult time making such a transition. Employees will have to be retrained and data may have to be converted and/or normalized. It will be nearly impossible for every team member to be pleased with the shift, and very likely, there will be rumblings of dissatisfaction. I think the most difficult job is being the decision-maker on a software transition. In fact, many software choices are completely fumbled by decision-makers too afraid of making the right decision. When your job or reputation is on the line, it isn’t easy to take the risk of choosing one platform versus another. It’s important to clearly judge what the effects of the software change will be months and years down the line. Yes, I’ve said this twice now: These platforms aren’t built for you, they are built for large populations of users. Otherwise, the business model for the manufacturer doesn’t make sense. And with this fact, it is important to realize that your individual company will be a small fraction of their business, which also means that their priority won’t ever be catering to you specifically. That is the complete opposite of custom software, where most likely, the firm that helps you in developing it will have a much smaller set of clients, which allows them to be more focused on customer satisfaction. When judging software packages, remember again that what you see is what you get. You’ll be at the mercy of the manufacturer for updates, changes, and support. In many cases, it may not be possible to reach a human being for support. While some companies may have concierge services, realize that it won’t come cheaply, and you’ll still be forced into using the software as they intend, not necessarily as you want or require. I am reading Peter Thiel’s book, Zero to One, in which he opens by describing simple economics, such as the difference between a competitive enterprise and a monopolistic one. His notion is that the competitive enterprise is, in fact, a negative endeavor. The amount of competition eventually drives prices down and makes survival difficult. Monopolistic companies aim to do what others aren’t, behaving differently to set themselves apart (not necessarily corner a market). Custom software allows even the most common businesses to set themselves apart from their competitors by solving the common problems encountered by customers with unique solutions. Obviously, this point isn’t applicable to every scenario. In some cases, why be different? But remember that customers typically find one or two reasons to choose a particular company or service over another. And custom software makes it very easy to create those reasons. Think about services that you use on a regular basis—even down to the most rudimentary level, such as a home contractor. In my neighborhood, almost everyone uses a landscaper for properly maintenance. These guys are stuck in the stone ages in terms of technology. I think landscapers are the last people being paid by check these days. How easy would it be for a landscaper to roll out a customer portal that allows customers to place orders, see their schedule for lawn maintenance, and pay bills? It would be a total game-changer, making their services much easier for consumers to utilize, and I’m sure it would provide them with all sorts of actionable data. Here is some homework: Think about what digital features would set your business apart from your competition. What headaches for your customers can be alleviated via smart functionality either on the Web or mobile applications? And what positive side effects can be realized with such a solution? Better insights via data analysis is a common one. With these thoughts in mind, ask your customers what the value would be to them. You may be surprised that even just a little bit of custom functionality can drive up your value and pay for itself over time. This is a consideration that many software customers never think about. Many people make the mistake of assuming that because a software provider is a large player, they would iterate to the newest technologies quicker. This is, in fact, completely false. Software companies are not incentivized to iterate quickly—this goes back to the mass appeal requirement of their platforms. Iterating quickly means unpredictability in terms of how those changes will affect the mass audience that uses their software. As such, large SaaS or software manufacturers roll out changes slowly. We’ve seen this be a major negative hurdle in the online video space, as an example. The largest video hosting companies have been slow to adapt to the fast-moving changes in their industries. The change from flash video to HTML5, for example, was a difficult transition. But even worse, the changes in video monetization and formatting have been challenging as the standards are fast moving, with agencies and advertisers oftentimes waiting on their video technology provider to adapt to the new techniques. Custom software allows you to take on the risks of transitioning to new technologies in small, manageable doses. You can experiment with new features without the worry of how it will affect other companies. Also, you can slowly roll out these changes into subsets of your software to try them with live audiences, in real time. None of those advantages exist with off-the-shelf solutions. I don’t want to downplay the value of any software that is available today. If it was all garbage, there wouldn’t be an industry to begin with. There are many areas where it makes sense to utilize third-party software as part of your digital ecosystem. Obviously, there are many great platforms for marketing automation—no one in their right mind would build that from scratch. The same goes for other specific applications. The key is to make all of these systems work together via a connection to a centralized hub that you control. This way, if parts need to change, you still have ownership over the most important part. This was actually covered in depth in last week’s blog post, where we discussed how the custom CMS is actually the logical centerpiece of a digital ecosystem, as it can tie multiple tools together rather seamlessly when well-designed. Parts may come and go, but your centerpiece must be something you can own and control. Your company may change marketing automation software when a new CMO replaces the previous. To be sure you have some flexibility later, choose a system that will control certain parts of your marketing stack, but maintain some level of freedom to choose a CMS platform. Avoid a lock-in that could plague your company by diversifying your toolset and avoiding the software provider that can do everything. I know this has been a long post, but it is an important topic that most likely will be covered in future blog posts as well. The debate of custom versus off-the-shelf will continue, much like the debates of Apple versus PC or chocolate versus vanilla. The difference is that once you make a decision, you are committed and will diverge from the alternate path. So it’s important for you to carefully consider your goals and objectives, your pain points, and what’s really important to your company as you contemplate how your business will operate. Hopefully, considering the above points will assist you in making the right decision for your organization. What's the Better Choice: A Native Mobile Application or Web App?